Traders were expecting a bearish US report this week, and the USDA didn’t disappoint, as both US wheat and corn stocks were raised higher. Export projections for both were trimmed and, with no fresh news from the US/China trade talks and a lacklustre demand for US wheat, further cuts in future reports cannot be ruled out. Spring crop sowings have commenced, but with weather deemed far from ideal, this could delay, or even stall, progress in certain areas. However, the recent concerns did little to deter the winter wheat crop, as ratings improved on the week. European prices remain mixed, with old crop little changed on the week, and new crop slightly lower. Firm cash premiums, linked to another decent shipping line-up continues to underpin the old-crop market. New crop levels have eased, mainly on the French agriculture ministry’s upward revision of the 2019 soft wheat area, now seen at just over 5mln ha, an increase of 2.8% on the year. UK prices, like those seen in Europe, are little changed. Market dynamics still show limited producer activity, although consumption buying has recently slowed, with demand far from robust as more competitive maize imports, now seen at 2mln t for the season-to-date, continues to undermine wheat usage. Main news of the week has been the EU’s agreement to grant the UK a six-month extension to Brexit, with the new deadline being 31st October – could be a very scary Halloween! In the UK, the extension to Brexit will allow both the export, and import, of grain at zero tariff to continue until at least the new deadline, and with the reported build-up in global stocks, an expected rebound in global 2019 wheat production, and a £25-30 spot-to-harvest price discount, depending on the region, we would still suggest current prices remain attractive to growers, and would advise liquidation of any remaining old crop supplies. The EU malting barley market remains very quiet, but prices have fallen by £2 to £3/t due to the good to excellent growing conditions. In the UK there is interest from maltsters for crop 2019 winter malting barley but little interest for buying spring barley. This week saw the release of the USDA’s April WASDE report, which fell broadly in line with trade expectations. World 2018/19 soybean stocks increased to a record 107.4 mln t (107.2 mln t in March), whilst the U.S 18/19 soybean carryout fell 5 mln bu but remains a record 895 mln bu (24.4mln t). Despite recent optimism, a trade agreement between the US and China is still not signed, but trade agreement aside, even if demand increased, buyers could still favour Brazilian supplies which are offered at cheaper levels. US weather still remains a concern, with cool/wet weather preventing any field work. This could lead to lower corn plantings and more soybeans for harvest 2020. Ongoing canola quality and political disputes between Canada and China have reached a stalemate. Canola vessels are still awaiting approval for discharge and though crush margins are firm, it’s unlikely any new business will be done until such issues are resolved. Meanwhile in Europe farmer selling on rapeseed remains slow, old crop crush coverage is ample with some crushers claiming to be fully covered. Exports are still available to the UK at levels equating to, or cheaper than domestic seed. 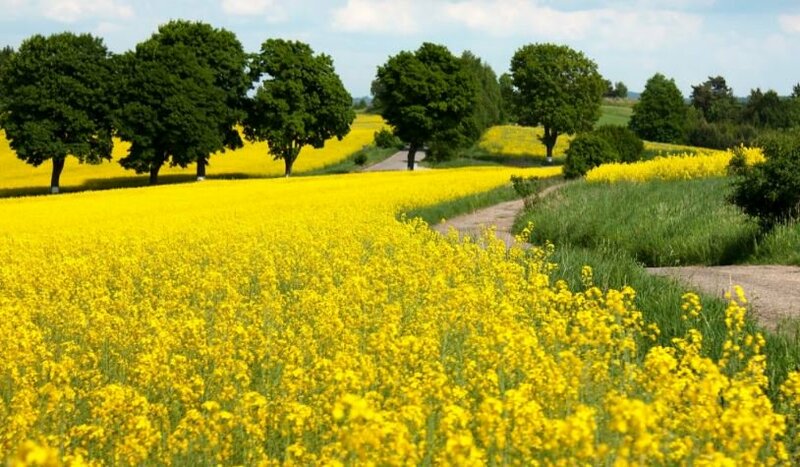 European rapeseed futures continue to trade in a narrow range and the increasing EU old crop carry-out may weigh on prices in time, but as concerns mount over new crop conditions in Europe its likely to be rangebound. Here in the UK, on farm prices trade close to last week’s levels, influenced by the direction of sterling rather than market fundamentals. KWS Firefly is one of the new wheat varieties which is gaining a lot of interest from growers and end users as a Group 3 soft wheat. Growers are drawn to KWS Firefly’s unbeatable combination of disease resistance characteristics and our market-leading grain buyback. KWS Firefly has a package to appeal to a wide range of growers across the country. Please speak to your ADM Agriculture Farm trader for more details. Mascani again is the preferred winter choice for the oat millers and as such is likely to sell out once again this autumn. Oats are gaining in popularity as growers look for a lower input break crop and a take-all break. Our advice would be to get orders placed early on this variety to avoid disappointment later. ADM has fantastic early order offers available across the variety portfolio. Please ring your farm trader for more details on our latest offerings across the hybrid, Clearfield and conventional sectors. Demand globally is currently at a high, keeping granular urea prices firm. The Indian tender has taken a large proportion of manufacturers availability with Pakistan looking to take another 100,000t to cover shortages. In the UK, markets remain stable. Colder, damp conditions in some areas have allowed for urea to be used for second and third applications and the long-range forecasts indicate below average temperatures into the second half of April. In the right conditions it is advantageous for farmers to utilise urea as it is currently the cheapest form of nitrogen available in the market. Contact your local ADM Agriculture farm trader or the fertiliser desk on 01427 421 237 for any enquiries. The ammonium nitrate market has remained unchanged for the last week. Currency volatility will be a key indicator for any new price direction and with Breixt delayed until the autumn, importers may now feel more confident to commit shipping more tonnes from Europe in April and May. Contact your local ADM Agriculture farm trader to discuss new prices.